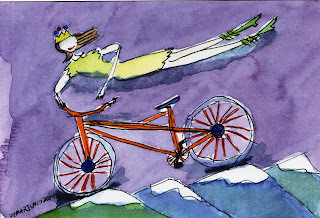 It may well be the 11th day of the 4th month but today is the first official day of the year on the Bicyclette Calendar here in lovely Baker City! Setting aside the regiment of the Gregorian calendar (and can anyone really get excited about the Year of the Rat?) it seems appropriate to measure the year by the first good bike ride! Colleen and I headed out just after noon and rode the roly-poly highway towards Pleasant Valley (the valley where it snows and blows more than anywhere else 'round here!) Although it wasn't my first ride of the year, it was the first ride without ear warmers, leg warmers and arm warmers and that makes it real - as in real sweet! As a child, my mother said that dinner hadn't officially begun until "Bev spilled the milk" and I realized today that some things never really change. The only difference is that it's no longer milk but my bike chain that gets dropped. Vive la difference!!! So, two hours later, back in my work clothes but with a hop in my step, I have to say how excited I am for the start of the year, how lucky I am to live in this beautiful place and to have such great friends. Did I really say that??? It sounds more like for your brother! I'm glad you had a good time out there on your bike and that you took some time to enjoy the Springtime weather. It's 76° today here in Seattle and I've been outside planting flowers in my baskets! Oh how wonderful!!! I spent the last 2 days up at Wallowa Lake... cold nights, great days! Bike Chain: Sigh...Oh the memories of being clipped in, throwing your chain and 'spinning wildly' out of control - then an awkward crash... because I never got out of the clips fast enough! Yep.. another little factoid about my previous life! I have a beautiful road bike gathering dust... It's a ciocc.. sigh..